I face-booked a few of my sisters closest friends before arranging a little food get together for my her coming home. When I say "home" I mean the Paris home, not the London home. It feels strange calling it that, but it is, a little bit like home now. I guess. I told guests to arrive earlier than she would, to surprise her for when she opened the door. Just before arriving home, she called me and asked me if I was in. "Yeah," I said. "I've prepared a little snack, don't buy anything," I spoke sternly but with no promise in my voice that what the little snack we would have for dinner would be particularly interesting. "Amazing!" She replied, "because I was going to pick up some Chinese takeaway as I'm starving.."
As she walked in the door, I was innocently rolling pizza dough out. 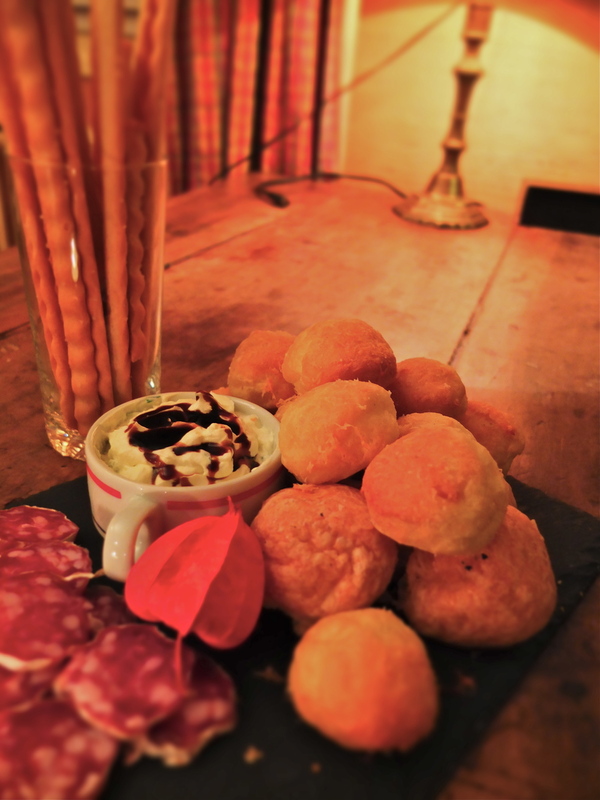 The door to the living room was closed and guests were sitting inside, with wine and gougeres I'd made for aperitif. "Sorry, the flat is a little bit of a mess", I lied, as I opened the door to invite her to the living room, her friends at a dinner party. How great is the unexpected? Here we have a chou mountain with chocolate sauce, salted caramel sauce and whipped cream. As a party host, I find that this is the best dessert to make at dinner parties because everyone gets excited about filling their chou with cream and dipping them in caramel and they feel like they've earned their dessert, a little bit. The choux pastry I used here was very light. I know my Italian friend would laugh at me if she heard me saying this (she saw me happily slicing away at the butter) but I used only water in the recipe, rather than half milk, half water. I am currently working on noting down all "base" ingredients and methods for basic French patisserie, choux pastry will go in that category so watch this space. Posted on December 3, 2014 by Abigail Scheuer and filed under dinner, desserts, chocolate, paris, sweet and tagged inspiration3. 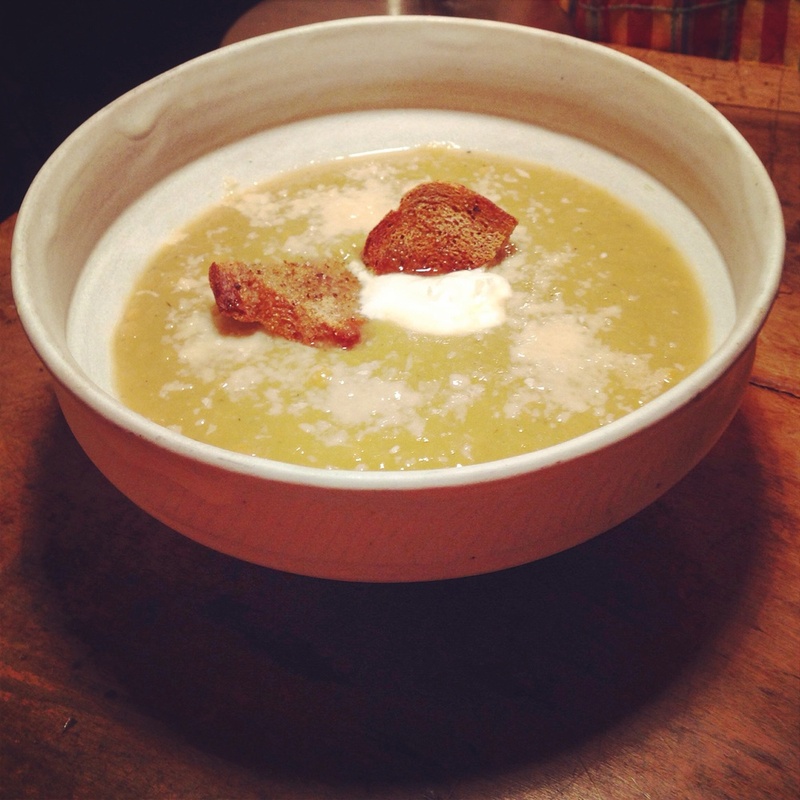 Soups are such great dinner options, especially as the evenings get colder and longer. The temptation to lie in bed with a big bowl of pasta and a hot chocolate is so tempting.. Here is a hearty soup, with chickpeas and parmesan. It has the perfect combination of everything you would want in a mid-week dinner. - Sweat the onions and 2 of the garlic cloves in the butter. Add the chopped leeks and allow to cook for five minutes. Add a pint of water and bring to the boil. Leave to simmer for 20 minutes or so, until the leeks are tender. - Add the stock and use a hand held blender to blend the leeks. You can also use any other food processor with a blending option. - In a separate large pan, fry the last garlic clove and the chickpeas. Using the bottom of a rolling pin or a potato crusher, crush the chickpeas whilst allowing them to cook in the garlic. Do not crush the chickpeas too much. - Add the blended leeks to the crushed chickpeas and add water if it is too thick. Season well with salt and pepper, remember to taste. - Generously spray olive oil, salt and pepper on the wholemeal bread and put in the oven to make your crostini. - If not already grated, grate your parmesan or grana padano. - Serve the Leek and Chickpea chowder in large bowls and put a tablespoon of Crème Fraiche or Greek Yoghurt/ Fromage Blanc in the middle as well as the grated cheese around. Crush more black pepper on the crostini and serve immediately. Posted on November 12, 2014 by Abigail Scheuer and filed under dinner and tagged recipes inspiration3. So the other day, I decided to join fitness first. My very motivated sister told me that I would get addicted to the gym. This has not yet happened, especially after the personal trainer told me that exercising too much was not actually a great thing to do, and if you do it too often, you can put weight on! Imagine exercising so much that you put on weight? My advice to all of you who are pumping iron every night to go home to your wives and have a big chocolate cake. That may make you slimmer. (May make you slimmer, please see small print for details*). She brainwashed me into eating more healthily, such as less carbs and sugar but more proteins, vegetables and fats. For this reason I decided to try it out, just as an experiment and just to see how tempting I could make it. You've been very good and healthy today you deserve it. Buy some smoked mackerel, egg and rocket salad from the supermarket. Wash the salad. Fry the egg. Arrange the smoked mackerel neatly on the plate, ditto for the salad. Chuck the egg to the side. Using your fork, cut the egg in an artistic way and scoop a bit of mackerel with your fork. The saltiness of the mackerel and the rocket really compliments the egg and you'll feel better than if you had eaten that egg with toast. *All information given on this blog is not scientifically researched and may not be used in court against any of the fact-givers. Posted on October 23, 2012 by Abigail Scheuer- Sarne and filed under dinner and tagged recipes inspiration. Savoury cakes do sound quite absurd to Brits but I reckon they're the best way to satisfy your baking need and have a delicious lunch. On this particular day I spent all morning looking at things I wanted to cook and procrastinating over profiteroles and other tempting treats. The ricotta in the fridge was looking neglected so I decided to whip up my own savoury cake. It took ten minutes of mixing and chopping and half an hour in a 180 C oven and was enjoyed a few times. Start off by chopping your cherry tomatoes in half with a tablespoon of olive oil and a crushed garlic clove. Put on a low heat while you prepare your cake mixture. -In a large bowl, lightly hand whisk your eggs with the olive oil. - Besides the pesto, add all the other ingredients. Make sure the cherry tomatoes are a little soft. - Mix half the mixture in a buttered or lined loaf tin then spread some pesto. - Add the rest of the mixture then finish off by dripping some more pesto. Bake at 180 C for 20-30 minutes depending on how good your oven is. Posted on April 19, 2012 by Abigail Scheuer- Sarne and filed under italy, dinner and tagged recipes inspiration.